Some time ago somebody figured out how to make glass cylinders that are useful for heating water using sunlight. The cylinders are long and thin, with an inner wall and an outer wall, with a vacuum space between the walls, like for a thermos. The inner wall of the glass is colored dark red, with the coloring in the glass itself, for better heat absorption in sunlight. These plain glass tubes are available on their own, for those inclined to start from scratch. But there is also a commercial version of solar hot water heater that uses these tubes, and already has a plastic support/storage housing, a screw on cap with a soft plug that fits into the top of the glass tube, and reflector panels on hinges, neatly arranged with a stiff wire stand. The plastic bits aren’t the most well-made things in the world, but they work, which is quite good enough. The glass tube holds about 16 ounces of water, and in a good summer sun it’ll have water scalding hot in two hours. I haven’t bothered to fiddle with a thermometer on this, but there is serious steam, and the water is hot enough that you have to worry about a significant burn, if you were to spill it on yourself. It’s good to be careful, when opening the lid! My experience with this gadget has been between Connecticut and Maine, covering latitudes in the low 40s, from mid-spring through mid-fall. For folks closer to the equator I expect it would be even faster, and for those farther north it would be interesting to see what the limits might be. With occasional clouds, or high, thin cloud cover, it still works. It helps to adjust the angle, early or late in the day (or season), by propping the wire stand on a cushion, so that the cylinder is not at such a broad angle to the sun. It also helps to fiddle with the position side to side, so the sun has a good angle that way. But really, it’s not that particular – I’ve forgotten about it, and come back some time later, and had good, hot water, in spite of less than perfect orientation. After four hours, the water is much too hot to drink, but would probably make quite good tea. I’ve now bought two of these – being glass, I’ve wanted to have a backup, in case of the inevitable. With the first one, the soft rubbery stuff in the plug arrived with quite a strong smell, and I was not hopeful. We left it to sit, open, for several months and it improved quite a bit. Then, after some use, it stopped leaving a bad taste in the water. This settling-in time is one of the reasons that I got the second one, so that it would have time to air out, in case the glass in the first one came to a bad end. From the same company, the second one did not smell nearly as bad, so perhaps they received feedback and changed the material. At any rate, it seems better. According to reviews, some people have actually put soup and other food into these cookers, but I have not been inclined to do that, because being so long and narrow I think that cleaning up could be difficult. 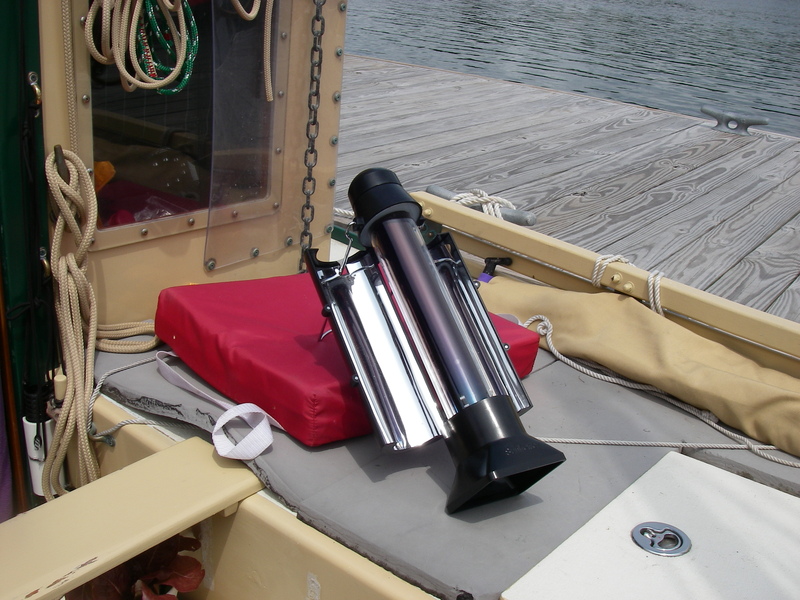 Just using this gadget for hot water has more than earned its place on the boat, and whenever temperatures are too warm for the heater stove, and the weather allows, it can be seen on AUKLET’s deck making quick and easy hot water. I was just two minutes ago commenting to my wife that we had not seen a recent post from you. Count to ten and your post arrived. While I have this power can I get you anything? I’m going to read your post now.